February 23, 2011 — Gulfstream Aerospace will display three of its business jets at Avalon 2011, the Australian international airshow and exhibition held biennially in Geelong, Victoria. Gulfstream will have both mid- and large-cabin jets on static display March 1-6 at Avalon Airport. These include the wide-cabin, high-speed Gulfstream G150; the large-cabin, long-range Gulfstream G450; and the large-cabin, ultra-long-range Gulfstream G550. Several members of the company's sales team will participate in the six-day show, including Roger Sperry, regional senior vice president, International Sales, and Jason Akovenko, regional vice president, Asia-Pacific. "Avalon 2011 represents an opportunity for us to demonstrate the capabilities of our mid-cabin aircraft and to confirm the far-reaching capabilities of our large-cabin aircraft," said Sperry. "The G150, for example, has steep approach certification from both the Federal Aviation Administration and the European Aviation Safety Agency, meaning it can land at and take off from a number of restricted airports, including London City. "The G550 can fly from Avalon to Anchorage, and the G450 can easily take eight passengers from Avalon to Hong Kong. We want our customers to know we have a full range of aircraft and can right-size the aircraft to their particular requirements. Avalon 2011 represents an opportunity for us to demonstrate the capabilities of our mid-cabin aircraft and to confirm the far-reaching capabilities of our large-cabin aircraft," said Sperry. "The G150, for example, has steep approach certification from both the Federal Aviation Administration and the European Aviation Safety Agency, meaning it can land at and take off from a number of restricted airports, including London City. The G550 can fly from Avalon to Anchorage, and the G450 can easily take eight passengers from Avalon to Hong Kong. We want our customers to know we have a full range of aircraft and can right-size the aircraft to their particular requirements." Gulfstream's large-cabin aircraft, including the G450 and G550, are some of the most popular in Australia. The G550 is powered by enhanced Rolls-Royce BR710 turbofan engines and has a range of 6,750 nm (12,501 km) at Mach 0.80 and a high-speed cruise capability of Mach 0.87. 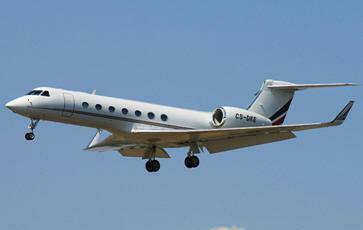 With its long legs, the G550 easily connects Washington, D.C., to Dubai, London to Singapore, and Tokyo to Paris. The G550 is renowned for its technologically advanced design and was awarded the National Aeronautic Association's Robert J. Collier Trophy, the most prestigious aviation award in the United States. The Gulfstream G450 is a direct descendent of the storied GIV®-series of aircraft, the best-selling business jet in the world. One of the most dependable aircraft in its class, the G450 recently received updates to its payload-carrying capability and performance. It can reach a maximum operating speed of Mach 0.88 and carry a team of eight up to 4,350 nautical miles (8,056 km) at its normal cruise speed of Mach 0.80. The G150, powered by two fuel-efficient Honeywell TFE731 engines, offers the best performance in its mid-sized class with a range of 3,000 nautical miles (5,556 km) at Mach 0.75. It also offers the most comfortable cabin environment in its class. Its wide-body fuselage provides stand-up headroom, ample aisle space and generous legroom and headroom for seated passengers.